Let’s come to write some scripts to install your XAP silently as out of browser Silverlight application. Hope, you have a Silverlight application configured as out of browser. Build the application & you will get the output file (.XAP) in the ClientBin of the web application. Copy this file to your local drive in a specific folder (say, C:\MySilverlightApps\). 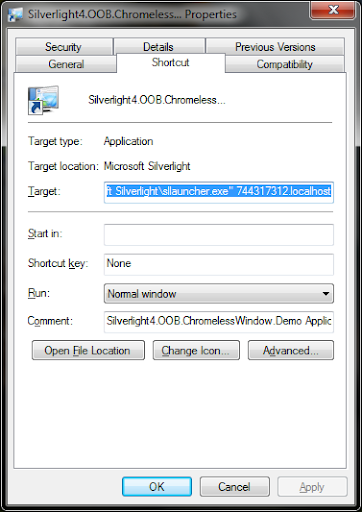 I am using my Chromeless Window Demo Application and hence the complete path of the XAP is: “C:\MySilverlightApps\Silverlight4.OOB.ChromelessWindow.Demo.xap”.